Oppo Rx17 pro has recently released its latest version of the European market, the Oppo RX17 Pro and the RX17 Neo, which offer high-end capabilities with Qualcomm processors. Today, we're talking about the particular Oppo RX17 Pro, the first Oppo phone with 3 cameras in the backend, The following is a comprehensive review of its specifications, so follow with us. Phone weight: The phone came to the Oppo RX17 Pro weighing 183 grams. - Dimensions: 157.6 x 74.6 x 7.9 mm. - The oppo Rx17 pro phone comes with a glass structure at the front end with edges, corners and edges of aluminum, and a rear plastic chassis (polycarbonate). 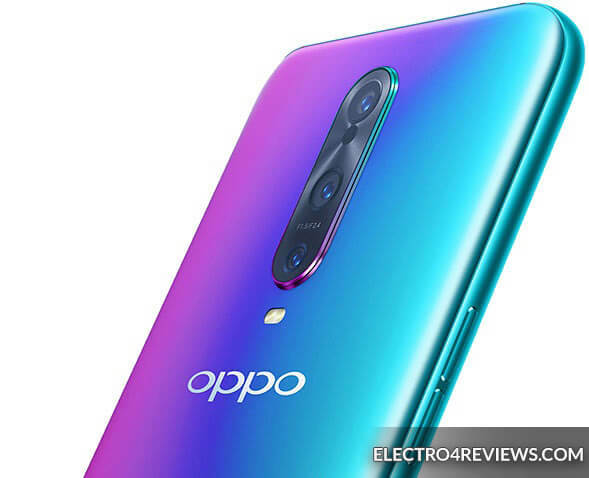 - The oppo Rx17 pro phone comes with Notch design, the design we first saw with the Oppo F9 phone, where the phone comes with a very small V-shaped top. - Screen measurement: 6.4 inches. - Degree of screen protection: The oppo Rx17 pro phone comes with a protective outer layer of corning resistant Gorilla scratch-resistant glass version VI. - Screen aspect ratio: The screen comes with a ratio of length to width 19.5: 9. - Front Screen Acquisition: The screen captures approximately 85.9% of the front of the phone. - The oppo Rx17 pro phone supports two slots for the SIM 1 and SIM 2 SIM cards. - The oppo Rx17 phone supports a reader to add the external storage card size Mico and a maximum of 256 GB, unfortunately uses the port of the second connection. 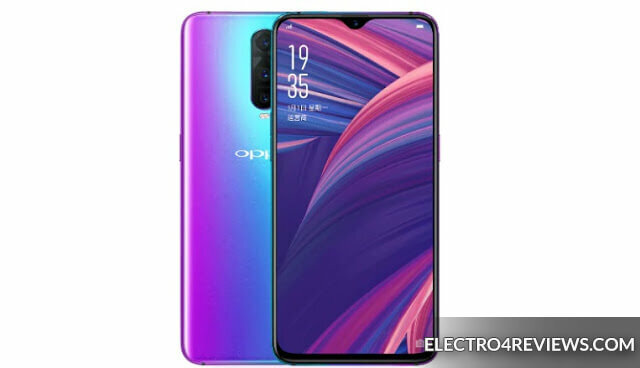 - The phone oppo Rx17 pro supports the USB port type C 1.0 with version 3.1, which supports the USB On-The-Go feature that allows the phone to connect to the external flash and transfer data from and to easily, and it supports the installation of mouse and keyboard games. 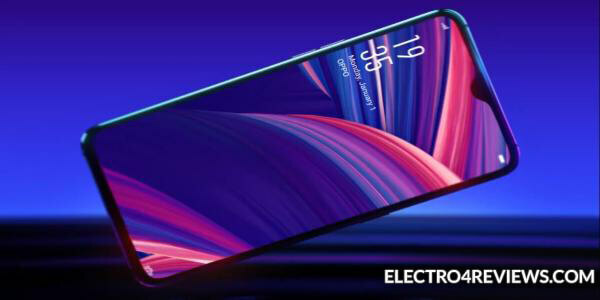 - Theoppo Rx17 pro fingerprint sensor is located in the front end and is integrated into the screen. - The traditional 3.5mm headset port has been removed. - Color options: The phone comes in blue with built-in violet. 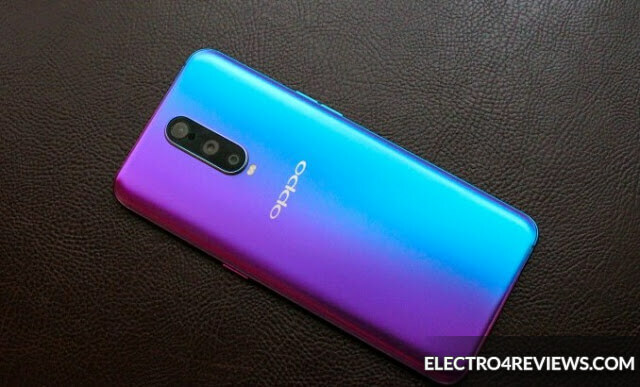 The phone Oppo comes with a very cool design in its colorful backlight, which comes with glossy, durable polycarbonate protection that protects it from breakage, shock and scratches. It also comes with a small nut that gives it an attractive look and supports the touch interface so that the notifications appear right and left naturally , And also supports the fingerprint sensor built-in screen with a scratch-resistant layer so as not to distort the screen with frequent use. - Type: AMOLED Capstive supports touch, also supports the appearance of 16 million different colors. - Screen Resolution: 1080 x 2340 pixels. - Screen pixel density: 402 pixels per inch. - Screen features: The screen supports multi-touch. - Protection layer: The phone comes with a protective outer layer of corning resistant Gorilla scratch-resistant glass from version VI. The Oppo RX17 Pro phone comes with a huge screen suitable for lovers of watching movies and series on the Oppo RX17 Pro phone, and it is also suitable for fans of the games, it offers a wonderful display quality with high pixel density, and is made of the AMOLED panels of the Samsung screens, which provide color resolution makes it even brilliant to use Under the sunlight. - Basic camera (rear): the first three-lens lens with 12 megapixels, a variable lens f / 1.5-2.4, the second with 20 megapixels, f / 2.6 lens, autofocus, and the third lens TOF 3D stereo camera Night. - Features: geo-tagging, touch focus, face detection, panorama, HDR feature. - Video capture: 2160 pixels at 30 frames per second, 1080 pixels at 60 and 120 frames per second and 720 pixels at 240 frames per second. - Secondary camera (front): The first monochrome lens with 25 megapixels, f / 2.0 lens slot, and can shoot 1080p video clips at 30 frames per second. The Oppo smartphone comes with a rear camera with a variable lens so it is able to take pictures with high quality with different degrees of lighting, when the light is less than the opening of the lens, which is heard by the introduction of a large amount of light and therefore the image is very clear details, while increasing the light narrowing theperture until the lens It takes only the light and produces natural images without any deformities or burns in the picture, and note that this is the first time that Oppo rx17 used this technique after Samson used it at first. The front camera is brilliant as well as the Oppo rx17 phones that are interested in silvi imaging technology, and the video recording capabilities of the phone are more than 4K. It supports multiple video recording speeds, which supports slow shooting technology. - Oppo RX17 Pro Chip Type: Snapdragon 710. - Oppo RX17 Pro Processor speed: 8KHz (2x2.2 GHz Kryo 360 Gold & 6x1.7 GHz Kryo 360 Silver). - Oppo RX17 Pro Graphics Wizard: Adreno 616. - Oppo RX17 Pro Sensors: Fingerprint (under screen), Accelerometer, Proximity, Compass, Gyroscope. - Oppo RX17 Pro Internal memory: 128 GB. - Oppo RX17 Pro Random access memory: 8 GB (RAM). - Oppo RX17 Pro External Storage Card: You can add an external storage card up to 256 GB. - Oppo RX17 Pro User Interface: Color OS 5.2. The NEW Oppo RX17 Pro phone comes with a Snapdragon 710 processor, the best processor currently in the middle class. It was used in the Xiaomi Mi 8 SE phone. The processor can handle many heavy applications without experiencing any slow or irritation of any kind. Qualcomm's high-quality graphics processor is capable of running many games with high graphics quality, all working together with a large random access memory that allows many applications to be stored in the background without the phone slowing down as these applications reboot. -Oppo RX17 Pro Battery Capacity: The Oppo RX17 Pro comes with a 3700 mA lithium-polymer rechargeable battery. - Fast shipping: The phone supports fast charging technology. - Wireless charging: The company has not announced the support of the phone for wireless charging technology. The Oppo RX17 Pro battery is perfectly suitable for screen size, processor and phone capabilities, but it is not the best compared to competing phones.